Genomic sequencing is key to developing drugs that can be repurposed alone or used in combination to treat new types of cancer. One of the biggest new innovations in oncology is the use of combination therapies, and a recent FDA approval for a pair of drugs (dabrafenib and trametinib) for lung cancer underscores that. This is a big step forward and we expect to see many more combinations approved in the future. But determining which are the right pairings for which particular tumors requires a lot of data. You have to figure out which patients carry particular mutations. That requires accurate testing tools, powerful analytics, and then reams of data to guide you. That’s one of the reasons WuXi NextCODE and others are so focused on building genomic databases and advanced genomic interpretation tools. So what was the latest step forward? Dabrafenib (Tafinlar®) and trametinib (Mekinist®) are now approved in combination for treatment of metastatic non-small cell lung cancer (NSCLC) for patients whose tumors have a specific alteration, called V600E, in the BRAF gene. About 1%-2% of lung tumors carry that mutation, which drives tumor growth and spread through the MAPK signaling pathway. The two drugs target this pathway but through different mechanisms. Dabrafenib is a BRAF inhibitor, and trametinib is a MEK inhibitor. Lung cancer is a common and usually deadly disease, so a new approval for even a small number of patients will still have a lot of impact. We must chip away at the mortality rate for this condition however we can, even if the progress seems incremental. Experts have a lot of hope that combination therapies will deliver the punch we’ve been looking for against many previously intractable cancers. That opens new paths for people who otherwise faced hopelessness. 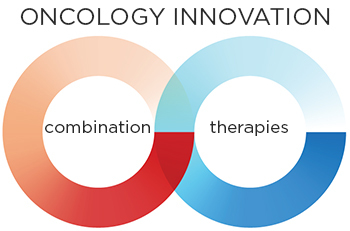 The more patients receive these combinations, the more we can learn about what works, and why. The data from today’s patients are a key part of what guide the treatments of tomorrow. This particular approval builds upon more than a decade of data from clinical trials. BRAF V600E has long been a prime suspect as a driver of several cancers. In 2014, the FDA approved this same combination of drugs for melanoma patients whose cancers were positive for the BRAF V600 mutation. In tandem with the approval of the two-drug regimen for NSCLC, FDA also gave the OK for the Oncomine DX Target Test, a next-generation sequencing test that can detect BRAF V600E in tumor samples. It screens for multiple biomarkers including BRAF, ALK, ROS1, and EGFR genes. These can all help guide prescribing decisions. “When we characterize lung tumors from patients, it’s a good idea to test the samples for all the changes that could be targeted by different drugs,” said Bruce E. Johnson of the Dana-Farber Cancer Institute, in a press release about this recent approval. Johnson co-led the clinical trials that were the basis for FDA’s approval of the combination therapy. It’s also important to realize how difficult it is to carry out these trials. As I noted earlier, this is a very rare mutation. To recruit the 59 patients for the combination trial that led to this NSCLC approval, researchers screened about 6,000 patients. This feat alone represents a “major achievement that underlies the difficulties in completing such a trial,” the study researchers wrote, in an editorial that accompanied the paper about their findings. These types of advances are spurring researchers to seek more links between established therapies and known mutations. “There are many additional drugs that can be repurposed alone or in combination to treat new types of cancer, and genomic sequencing will be key to both the research and clinical implementation of these new advances in cancer treatment,” says Lund. WuXi NextCODE, meanwhile, is trying to accelerate progress by providing a comprehensive but user-friendly informatics suite that “allows clinicians to perform complex big data queries and interpretation on a case by case basis, and to annotate that data even if they lack formal computational training,” says Bailey.